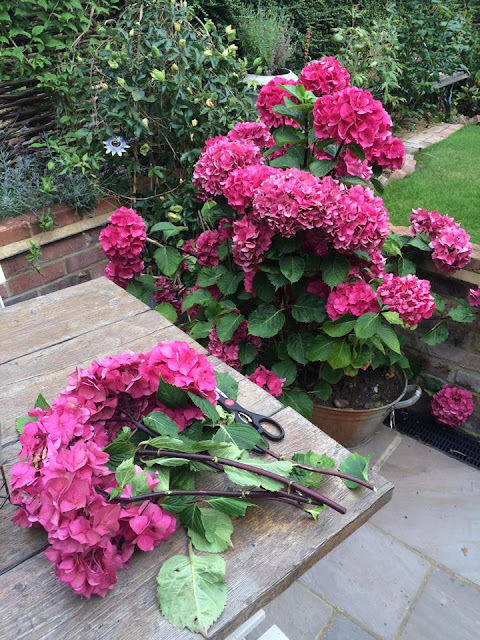 One of the things that I get asked a lot on Instagram is how to dry hydrangeas. I love the colours as they start to dry at this time of year, deep dusky pinks as their petals lose their moisture and turn all papery. 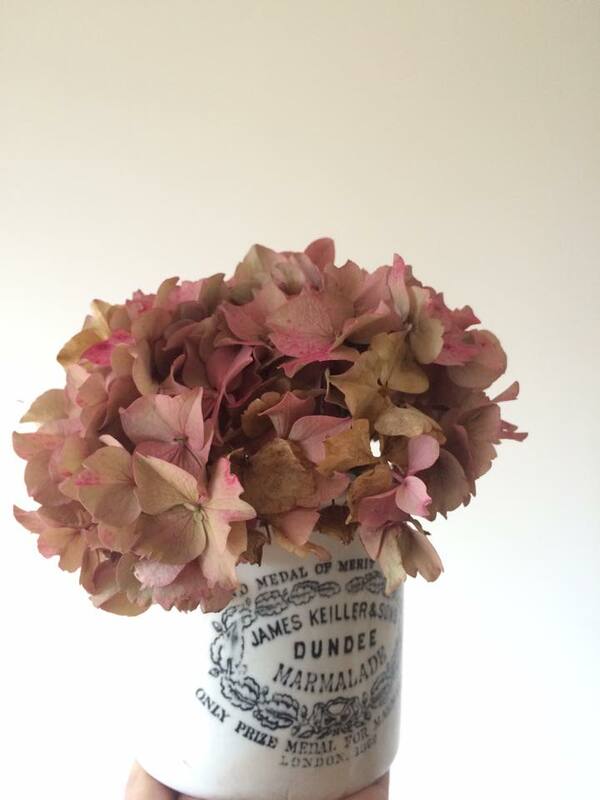 If you dry them successfully, they can last for years and make an everlasting floral display. 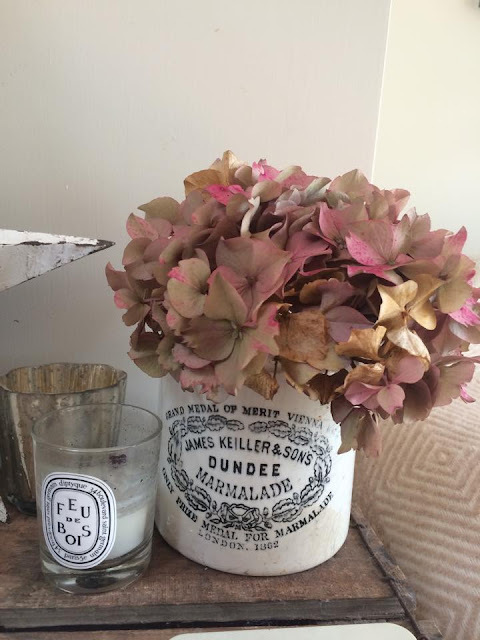 My Mother in law dried some of the hydrangeas from our wedding display whilst we were on honeymoon, which has made for both a lovely keepsake that's now part of the kitchen. They're in the galvanised jug in the photo above. 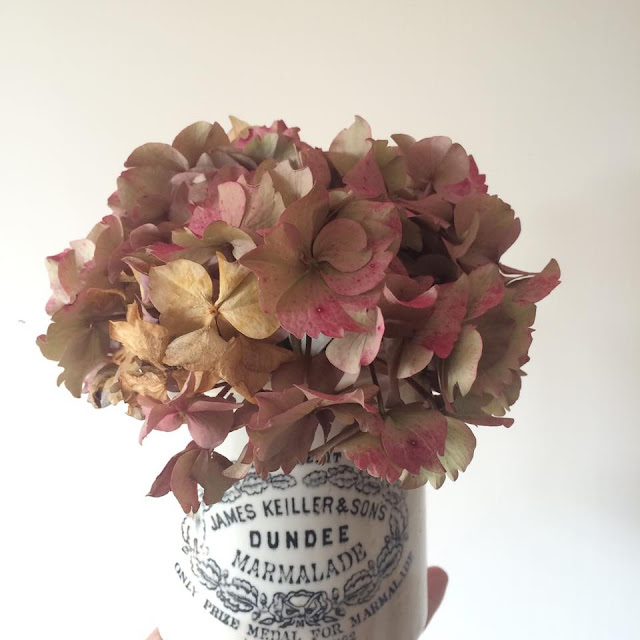 Since then, I've tried to dry some more hydrangeas from the garden with varying success. I've read up a lot about it and this is what I've learned. When my Mother in law dried mine, she simply strung them all together with string and hung them upside down near her back door. They were in the light and had airflow, she left them there for a couple of weeks. 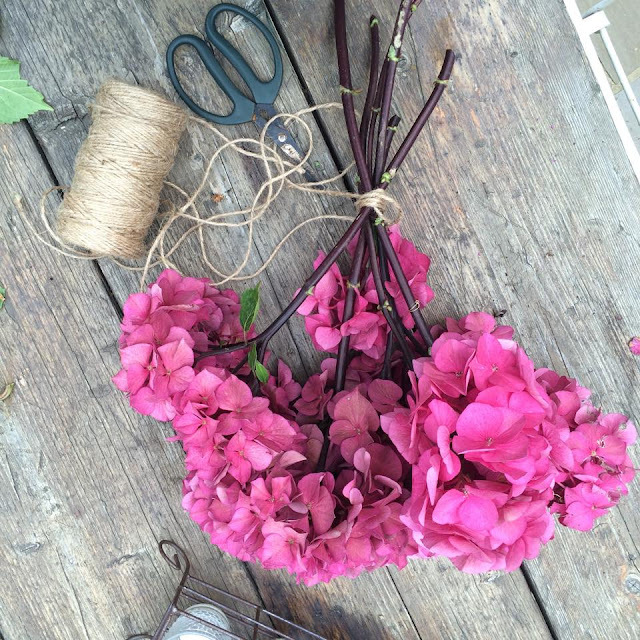 I don't remember what type they were from my wedding flowers, or how papery their petals were to begin with. After the wedding we just handed out all the leftover flowers to our friends and family before we went on honeymoon. After googling, hanging them upside down is one of the main drying methods. You need to strip all the leaves off and leave them somewhere cool. Some people say that a dark room is best so they don't lose their colour, others say you need light and airflow. Not very helpful. All I know is that the ones above were dried in the light near a window. 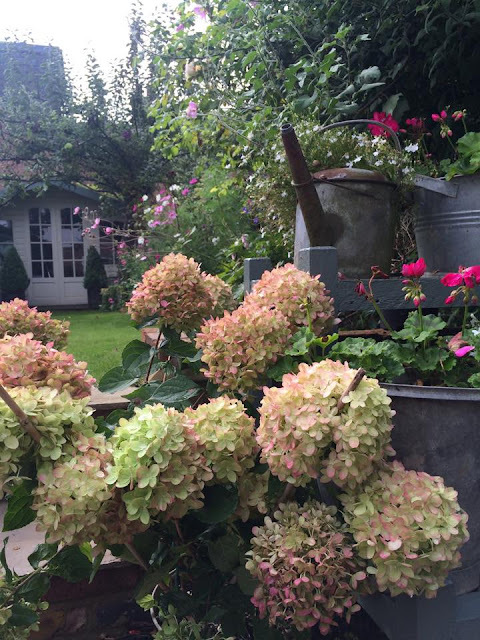 However, the key is to pick your hydrangeas from a bush when they have already started to dry out a bit. I picked these ones, above and below, about a month ago and they were nowhere near dry enough. They just shrivelled and turned a bright bluey/purple colour! So I think it's a good method to try but make sure they're dry enough in the first place. Might not always work but worth a gamble! September is now a perfect time for picking them, the colours have faded from that bright pink, to a duskier more of a brown colour and you can feel that the petals have started to dry. 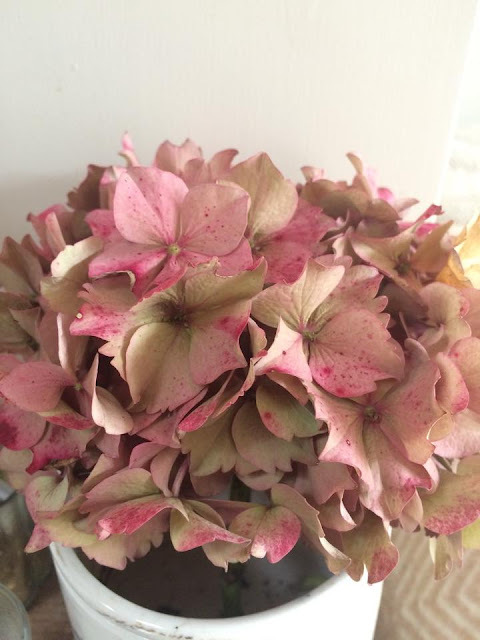 I picked a couple last week, the day before I went away, and have tried to other method of drying hydrangeas by leaving them in a vase with just a tiny drop of water. I left these in marmalade jars with about a centimetre, maybe 2 of water and have just left them. A week on and they're definitely drying and hopefully will continue to dry out and keep their colour although I expect they will fade maybe a little more. Again, you want to strip all the leaves off first to reduce moisture loss through the leaves. So, the real trick is picking them just at the right time. You want them to be drying on the bush but pick before they get too brown on there. I love their changing colours as they begin to fade. 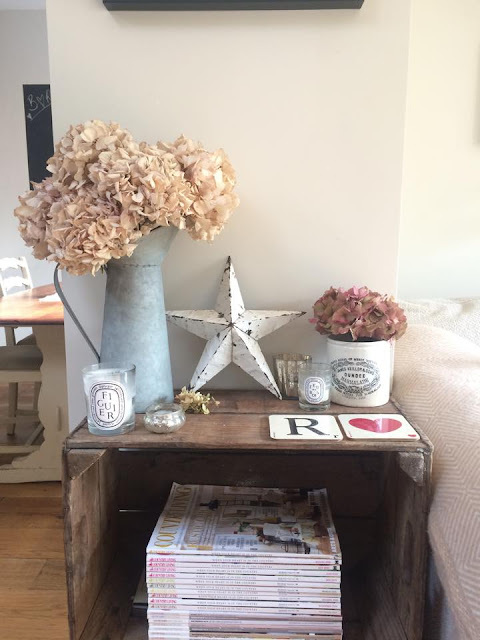 Perfect for autumn displays. 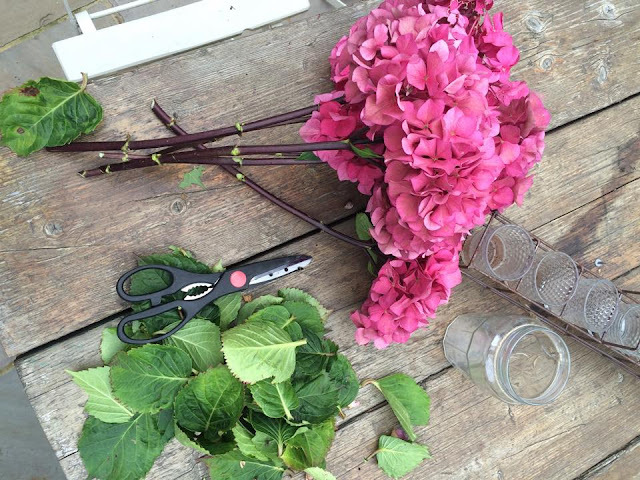 Have you had any luck drying hydrangeas? I think it's partly down to luck of the drawer and the type of hydrangeas you have. There's another method involving glycerine, I think it's a liquid you put in the water which helps to preserve it. Need to google that some more I think. But for now I'm happy with these pretties! I got the marmalade jar from Kempton Antiques in case you were wondering. I blogged about it back here, but planning to write an updated post from my most recent trip there in the next week or so. 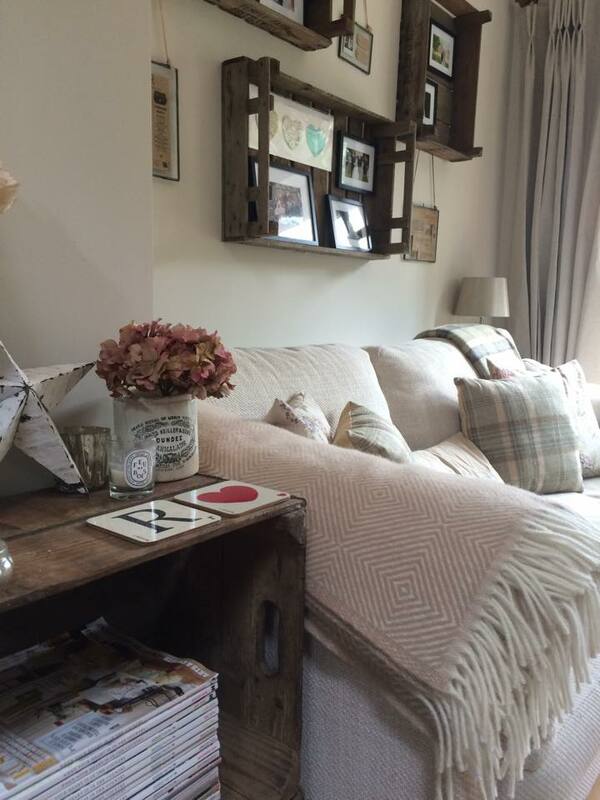 I've also started updating the house for the changing seasons into autumn, bought a couple of new throws and the tartan cushions have come back out. Might blog about that sometime soon. September is one of my favourite times of the year. Not too chilly yet but a definite nip in the air and all the excitement of autumn to come. Happy hydrangea drying! Let me know how you get on.